Predictably, this week opens up at a green house with two people pushing their way through the vines to get the pot seed pods. It's not too long before the presence of the stoners becomes noticed by the green zombies. Outside the greenhouse, Odegard gives a lecture to people about how the greenhouse contains the herbal vaccine against the zombie virus. Members of the crowd ask for proof and Odegard replies that for years batch 47 had been hidden away until he found it. Holds up sheers and asks who has what it takes. What he doesn't know is that Murphy and Cassandra are in the crowd. From the back of the crowd Murphy tells Cassandra maybe they won't have to go to California. Murphy barges into Odegard's tent and is told that they are closed for retail sales of Z Weed. Murphy turns down the weed for himself but points out that Cassandra might wants some and then suggests that he has something Odegard is going to want to hear. There's a zombie hand sticking out of some weeds and Odegard calls it a phylo-zombie which means it's part zombie and part plant. Murphy moves his finger in front of the zombie hand and it mirrors his movements. Odegard tries the same trick and nothing happens. Murphy then exposes one of Odegard's zombie heads and the moment he touches the zombies face, it calms down and stop trying to bite. Odegard realises that he is dealing with the real Murphy but asks to see the bites to make sure. Murphy asks how real batch 47 is and Odegard pulls out a paper saying that test subjects remained free of the zombie virus but the test results which include reports on side effects has been lost. The conversation is interrupted by a phylo-zombie killing another one of the harvesters that Odegard sent into the greenhouse. The next person to volunteer asks that her baby told that her mama loves her before entering the greenhouse. Unknown to everyone is the fact that Doctor Kurian has been spying, and naturally he has recognized Murphy. In the arctic, Citizen listens to a radio report which says that Murphy has been seen in Minnesota. Citizen Z is impressed that he was able to understand the message because the person spoke in Spanish. Citizen Z then gets on the radio looking for Delta X Ray Delta but of course gets no answer. Warren and crew show up at the greenhouse and are told to wait until they are called. Doc is of course happy to smell the Z weed. The woman volunteer crawls out of the greenhouse yelling for help. Vasquez shoots the zombie but it keeps moving so he is forced to bash its head in to save the woman. Warren and crew help the woman into the waiting tents. One of Odegard's men comes out side because of the commotion and tells Warren and crew to go and wait in the garage for their turn to try and harvest. Cassandra gets her toke on and is clearly loving it. Odegard tells Muprhy that he stumbled on this place and all he had to do was harvest it and get the world out. Odegard says that the government was growing a lot of dangerous plants and the workers got trapped inside becoming phylo-zombies. Murphy snarks about the population being worried about GMO tomatoes. Odegard adds that they have not been able to get close enough to batch 47 to get a good sample. Warren helps the injured woman to her child and Doc uses maxi pad as a bandage to cover her wounds. The woman tells the child that they haven't found the cure yet but are getting close. Murphy walks boldly into the greenhouse with Odegard on his heels. The vines immediately wrap themselves around Odegard so he uses a sharp knife to free himself. This causes Murphy to stop and complain about getting a stabbing pain. They continue to move through the greenhouse and when Odegard is stopped by a phylo-zombie, Murphy uses his mojo to free him. Cassandra waits outside of the greenhouse for Murphy and she has Odegard's guards pointing weapons at her. Odegard and Murphy make their way to batch 46 and Murphy is forced to stop because he can feel the phylo-zombies. The woman explains that her child doesn't have much time to live and that she promised the girl after shooting her father in front of her, that she would not allow her to turn into a zombie. Addy tries to comfort the woman by telling her she is a good mother and this is when she admits that the child is not hers. It seems that both the woman and the child have no one but each other since their families have all died. Addy moves to check out a radio she found and 10K calls to Warren to show that he has found Cassandra. Both Warren and Vasquez agree that Murphy cannot be far away. In the green house, Murphy and Odegard have reached the infamous batch 47. Odegard instructs Murphy to only grab a few pods, so as not to stress the plant out. Murphy reaches out and starts taking pods and it gets the attention of the largest phylo-zombie. Murphy apologises and backs away quickly. The little girl is awake now and she tells her mother that she is afraid and wants to go to heaven. The child is convinced that if she turns into a zombie that God won't let her turn. Addy gets the radio working and manages to pick up Citizen Z's transmission. Unfortunately the connection between the two is not good. Addy reports that though Murphy is off mission they think they know where he is. Citizen Z is adamant that the lab in California is still waiting their arrival. Citizen Z gives Addy the last known co-ordinates for the lab before the connection between them is dropped. What Addy didn't realise during her chat with Citizen is that she is being watched. Back in Odegard's tent, Odegard blows some of the sample he collected up a zombies nose only to have the zombies head explode. Odegard notes the results and cuts the dose in half before giving it to another zombie. The zombie is not effected and so Odegard changes the dosage again. This time the zombie turns to them and says, "brains." Both Odegard and Murphy celebrate because this means that the pods produced a success. Cassandra interrupts their celebrations to inform Murphy that Warren and the group have arrived. In the garage, 10K reports to Warren that he has been spotted by Murphy and so the group begins to plot how to get Murphy under control again. Before they can act, Murphy enters the garage. Doc makes it clear that he is getting tired of chasing Murphy and Vasquez tries to attack him but is stopped by Warren. Murphy tells the crew to chill out because the greenhouse has a cure for the zombie apocalypse and all they have to do is go and get it. Odegard tells the group that they just tested Batch 47 and it's real. Murphy argues that this means they won't have to depend on him to save the human race. Warren shoots Murphy down until the woman begs her to reconsider. The group is lined up in front of the greenhouse and Odegard offers them new weapons because bullets don't kill plants. Vasquez tells Warren that he doesn't understand why they are risking their meal ticket. Warren instructs Murphy to lead the group into the green house. The moment the crew enters the phylo-zombies become restless. Murphy makes it to the pod zombie and tries to calm it as the others are attacked by phylo-zombies. Warren quickly grabs some pods as Murphy loses control. Murphy runs off yet again and the group is forced to run the other direction to avoid the phylo- zombies. When Murphy gets outside he finds himself in front of no other than Dr. Kurian. Murphy immediately attacks him and Kurian says that Batch 47 is a dead end and that humans won't survive but Murphy and his kind will outlive humans and zombies. Kurian adds that he is going to help Murphy inherit the earth. Murphy asks why he should trust Kurian and Kurian simply says that Murphy knows he is right. A gang who financed Kurian's work shows up and Murphy and Kurian decide to hide. Who should pull up but Escorpion (that's right bazooka man). Escorpion makes his way to Odegard's lab to pick up his shipment of z weed for the month. Odegard has it ready to go and Escorpion snarks about making Odegard employee of the month if he keeps up the quotas. Escorpion turns his attention to the people in the garage and Odegard lies and says that they needed to hire some temps to deal with the large harvest. Unfortunately for Odegard, Escorpion doesn't believe him and instead thinks that Odegard is working on a cure. Escorpion believes that Odegard is killing their customers faster than the zombies. Odegard shows Escoprion the last vial of the first batch and informs him that they got a zombie to say brains. Escoprion suggests that it is time to move onto human trials and drags Odegard outside. Escorpion introduces himself to Warren and says that he is vice president of sales for a drug cartel. Escoprion notes that the crew has been harvesting batch 47 and asks them to hand it over. Doc hands over all the samples except for one. From the back of the crowd Kurian and Murphy slip away after Kurian asserts that if Escoprion finds them that he will kill them both. Murphy heads into the greenhouse and Kurian decides to take his chances outside. Vazquez aims his gun at them from a distance looking for a clear shot. Escoprion announces that to test the drug they need a fresh zombie and his man responds by shooting one of Odegard's men in the stomach. Odegard says that he has only ever tested it on a zombie and has no idea what a safe human dose is. Escoprion pours the powder into a device as Odegard explains that it only take a micro dose and anymore than that could be fatal. Escorpion decides to test the assertion by forcing the the last of the powder up Odegard's nose. Odegard says he feels good so Escopion orders the zombie be brought over but when he turns back to Odegard he has turned into a zombie. Escorpion declares batch 47 a dud and orders his men to grab the z weed. One of the Escoprion's men has found Doctor Kurian. The doctor is knocked unconscious and placed in Escoprion's truck. Escorpion orders the site burned down and says that he and his men need to get back to their core mission. The men start to spread gasoline around the greenhouse. Vasquez stops one of the men by gunpoint and demands to see his tattoos. The man asks Vasquez if they know each other and Vasquez's response is to shoot him in the head. Inside the green house, Murphy is trying to encourage the giant phylo Batch 47 zombie to leave the green house because is it is on fire. The other phylo-zombies wrap vines around Murphy as he tells the giant zombie that he is trying to help. Warren and crew make their way back into the greenhouse just in time for Murphy to rush past. Outside Warren is forced to free Murphy who has been entangled by the vines. The giant Batch 47 zombie has made it's way to the entrance of the greenhouse and the crew is forced to intervene when it goes for Murphy. Even as Murphy screams in terror he instructs that the giant zombie is not to be killed. As Murphy screams no, the giant zombie is pulled into a fan and explodes. Warren helps Murphy into a truck and Doc and Addy make their way to the woman with the child. Doc hands over the pods and suggests that the girl is to chew on the leaves. Doc believes that it won't hurt her because it is not a concentrated dose. Addy and Doc wish the woman good luck before leaving. The woman cries as the child dies in her arms. Driving away from the greenhouse Murphy tells the group that they shouldn't have killed the zombie. Vasquez points out that Murphy is alive. Murphy questions why they are headed south instead of west and is informed that there's too much fallout to the west. Serena appears in the middle of the street and Warren notes how pregnant Serena is. Warren stops the truck as Murphy begs her to keep going. Addy hops out of the truck and embraces Serena who says that she is looking for her baby daddy. Serenea rushes to the truck calling Murphy daddy. Murphy tells the fetus that daddy is here and here and a face becomes visible on her stomach. It's official, we now have two new characters of colour. Does Emillio Rivera ever play anything but a gangster of some sort? I kept picturing him in Son of Anarchy. Fortunately for Rivera he does it well. I wouldn't want to run into him in a dark alley. At any rate, I digress. As much as I enjoy seeing Rivera in something new I think that it's a problem that the writers have introduced a cartel of colour into the show. Once again, criminality is being represented by POC. Then there's Vasquez. I really want to know his story and I am suspicious of him asking his victim to see his tattoo's. The fact that he moves like some kind of trained agent however does give me some sense of relief. Murphy is still desperate to avoid his fate in California. Is it me me, or does he seem to care more and more each episode what happens to the zombies? It's clear that he doesn't view them the same way as the other survivors. For Murphy, even though zombies have the potential to be his mindless slaves, he clearly sees some sort of value to them and seems to act humanely towards them when they are in jeopardy. Murphy's baby mama has arrived. 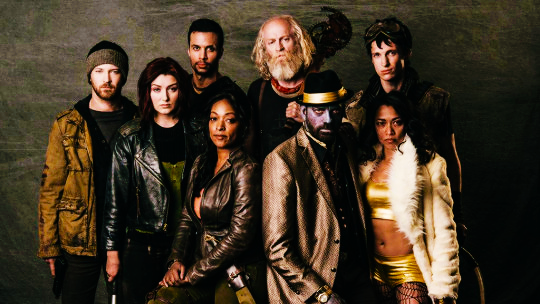 Does Z Nation really need the introduction of the kind of humor this is going to bring? Naturally, Murphy is a reluctant father and I cannot see this going anywhere good. I am still very upset about Cassandra. She seems to have receded even more into her zombie persona. She displays absolutely no agency and seems utterly content to hang around and do Murphy's bidding. This needs to change yesterday.